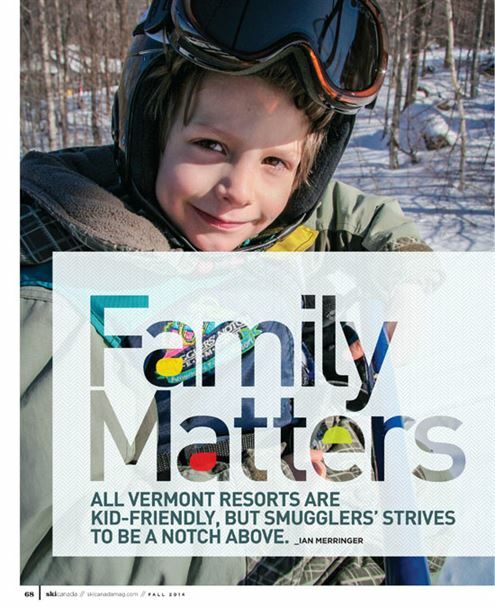 All Vermont resorts are kid-friendly, but Smugglers’ strives to be a notch above. The day was going to be perfect, four inches of fresh snow, mostly sunny, just a few of those slight Fahrenheit degrees below freezing. So said Rockin’ Ron the Friendly Pirate. He’s the guy who dresses up like a buccaneer by night to sing and tell pirate jokes as he cruises tables at the Morse Mountain Grille. It turns out he also does the snowphone recordings each morning at Smugglers’ Notch, Vermont. His snowphone recordings aren’t in character, mind you. You don’t have to guess what a pirate’s favourite letter is (it’s R, by the way) before hearing the day’s conditions. I only recognized his voice after he excitedly passed me a weather report sheet in the base lodge a day earlier. His timbers were shivering about a storm due in two days. That’s Smugglers’ Notch in a nutshell. Their sworn mission is to meet the many and often urgent needs of children, but below the surface, it’s still a place where real adults go for the kind of grown-up skiing that rivals anything else in New England. We were on our first family ski vacation with a four- and a five-year-old in tow. Smugglers’ Notch has had the reputation of being the best family ski resort for many years, so it seemed like a good fit. Smugglers’ got its sneaky name more than 200 years ago when U.S. President Thomas Jefferson outlawed trade with the British Empire to stay neutral during the Napoleonic Wars. Not all enterprising homesteaders in Northern Vermont were willing to give up Montreal as a market, though, so they started smuggling trade goods north through the Notch that separates Smugglers’ from Stowe. There’s no such embargo on Canadian commerce today. 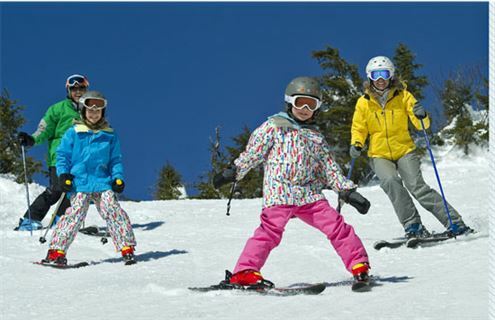 In fact, resort bean counters claim that during mid-March when kids in Ontario and Quebec (but not Vermont) are on school break, eight out of 10 skiers on the hill here are Canucks. The trip is getting easier all the time. It’s only a two-hour drive from Montreal, and six or seven hours from Toronto, depending on your highway speed and if you stop at the duty-free store. Travel from points east of Montreal is now streamlined, thanks to the two-year-old Hwy 30 that bypasses Montreal to the south. But for Torontonians in a hurry, Porter flies directly to Burlington, just a 40-minute drive from the mountain. Dropping the kids off for lessons the first morning, I had the distinct feeling they were in good hands. Their skis went into an upright bin with wheels that looked like a less hilarious but more expedient strategy than having a class full of four-year-olds in ski boots carry skis across a snowy slope. Though it turns out they don’t do much walking. After getting their colour-coded vests and GPS trackers, the kids were herded into a hay wagon and driven a few hundred metres to one of the two parallel chairs that rise, barely, up the gently sloping Morse Mountain. As the tractor grunted and the wagon wheeled away, the benefits that adults realize from this child-first approach came into focus. The lessons run from 9:00 a.m. to 2:30 p.m. Lunch is provided. The kids are gone—and the day is yours. A shuttle bus from the village or a traverse from the top of Morse gets intermediate and expert skiers to the day lodge at the base of the steeper Madonna and Sterling mountains. Riding the chairs solo, it wasn’t long before I ended up beside some of the 80 per cent Canadian content I had heard about. Alastair Hopkins, 23, from Toronto, had been to Smugglers’ with his parents repeatedly while growing up. As sometimes happens, he had traded them in for a girlfriend on this trip. He clearly wasn’t here as part of some focus on the family. What brought him back was Smugglers’ slow but sure loosening of its off-piste policy. Over the course of his many visits, Smugglers’ had opened up its terrain with a live-and-let-ski attitude. There are a dozen gladed areas marked on the map now—and many more you have to find on your own. And by gladed, I don’t mean token trees left here and there. The canopies are intact overhead and the trees are spaced to challenge. We took three or four runs, watching out for each other through different tree stashes on Madonna. On the trips back up he tried to provide directions to more hidden woodlots. The best pockets can be hard to find, since they are not that distinct from the normal tree cover, but we had lots of time to discuss directions. As Hopkins pointed out in a moment of reluctant criticism, all of Smugglers’ six chairlifts are fixed-grip doubles. There is no quick way to the top. But Vermont is not Tremblant or Whistler. Clarke was here, again, from Brantford, west of Hamilton, Ontario. He’s come for a week every year since his nine-year-old twins were three. It’s the ski school that brings him back. The last four years in a row his children have had the same instructor for their week of lessons. So there’s an obvious head start in avoiding the lag time at the start of each group of lessons when the instructors have to assess the kids and make sure they are in the right group. But why stop there? The instructor emailed the family ahead of the week to discuss what they’d be working on when they got on skis. The lasting satisfaction isn’t due just to the lessons his kids get. The village set-up is another selling point for parents who want a relaxing holiday. “You don’t have to ever get the kids in the car. You show up here and put the car keys away,” said Clarke, giving a nod to the village’s fleet of roving and on-call shuttle buses. Later that first day I saw what he was talking about. After picking the kids up from ski school and taking a few runs, we started ambling toward the fun centre. It would be a walk of about 150 metres and I felt sure we would survive it. I heard a rumbling diesel approaching slowly from behind and reflexively told my kids to get to the side of the road, even though they already were. The shuttle bus slowed to walking speed beside us, door open, driver beckoning us to hop on. I told him we were fine, not going too far. Instead of pointing out that they were kids with legs, we did as he bid and learned that not only do the shuttle buses come to your door when you call for a pickup, and stop on the road even if you aren’t hailing them, but they have classic rock playing on the P.A. Our destination was the Fun Zone. A better name might be Pleasure Dome. It’s an inflated bubble of the sort that less fun-loving types use to shelter tennis courts in the winter. This one is packed with bouncy castles in every style known to the middle ages, mini-putt courses, pinball machines, obstacle courses, ping-pong, carnival games, towering slides, shuffleboard and a spinning rope ladder that I defy any dizzy adult to reach the top. When kids outgrow the Fun Zone, they graduate to one of two Teen Zones, après-ski refuges for teens from their parents, or vice versa. This independent teenager era of Smugglers’ is the new reality for David Drapeau’s family from Ottawa. He’s been coming for a decade, his kids are now 12 and 15. We rode Morse Chair together on my third day and he pointed to a cluster of buildings in the woods on skier’s right. Like all accommodations at Smugglers’, they are all self-contained units with their own kitchens. These ski-in/ski-out chalets are called the Willows, and one of them is his. Which is exactly what my wife and I then did, a little early on this, our last day, so we could ski longer with the kids. As I collected my youngest Nora, the instructor called after her: “See you next year.” It was too early for me to be sure of this, but I could understand the instructor’s confidence. It turned out Rockin’ Ron had been right with his forecast. As the promised sun started to weaken, the kids were eager to show off what they had learned. In three days with the instructors Nora’s big brother Elliot had gone from snowplowing to carving somewhat regular parallel turns and now he was trying to incorporate his tuck into the mix. Nora wasn’t so concerned about aerodynamics. Her snowplow turns had gained a measure of elegance, if such a thing is possible, but mostly she wanted to sing. Standing tall, arms wide, belting out whatever the Katy Perry song of that week was. The storm that had excited Rockin’ Ron was just a day away now. We wouldn’t be around to enjoy the foot of fresh snow, but I had a good feeling that Ron would be particularly pumped for his show at the Morse Mountain Grille that night. At Smugglers’, what’s good for the adults, is good for the kids, and vice versa. 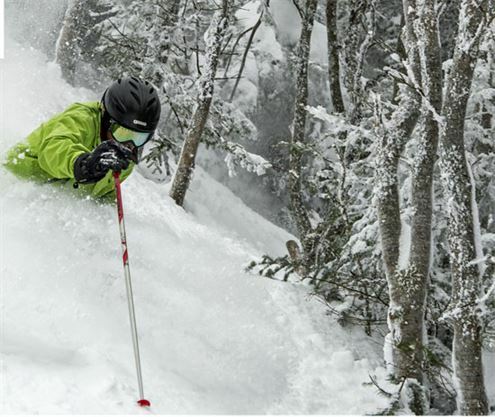 One ski lift that Smugglers’ Notch should rightly brag about is a mere eight metres long. This, the shortest Magic Carpet lift known to humankind, takes up a small part of the outdoor yard at Treasures, Smugglers’ slopeside daycare centre. Parents show up by shuttle bus with kids and skis. They leave the kids, step into the skis and shove off. Treasures takes kids as young as six weeks. Staff will field calls from nursing mothers on nearby chairlifts wondering if they have time for another run before they drop in for a feeding.